I love cheese grilled on the grates, but it is hard to find. The Castello cheese company contacted me about their cheeses. I noticed that the Havartis could be grilled. Since it is a semi-soft cheese, I'm guessing that it is meant for the more traditional grilled cheese sandwich in a pan. I mentioned this, and Castello sent over the Havarti as well as slices of blue cheese for grilled burgers to sample for free. Since the Havarti is not specifically marketed for grilling, I was super careful with the cheese. I sliced it pretty thick - close 1/2 an inch thick. I also offset the heat. In other words, I had coals on one end of my cast aluminum grill and none on the other. I put the Havarti Dill Cheese on the side with no coals, so the heat would not get too intense. As soon as the cheese start to dip or bulge between the grates, I immediately flipped the cheese slices, so it would not fall through. I did miss one, and it dropped fast. So, since this is not a high heat cheese, it's important to have low heat under the cheese and to flip quick. 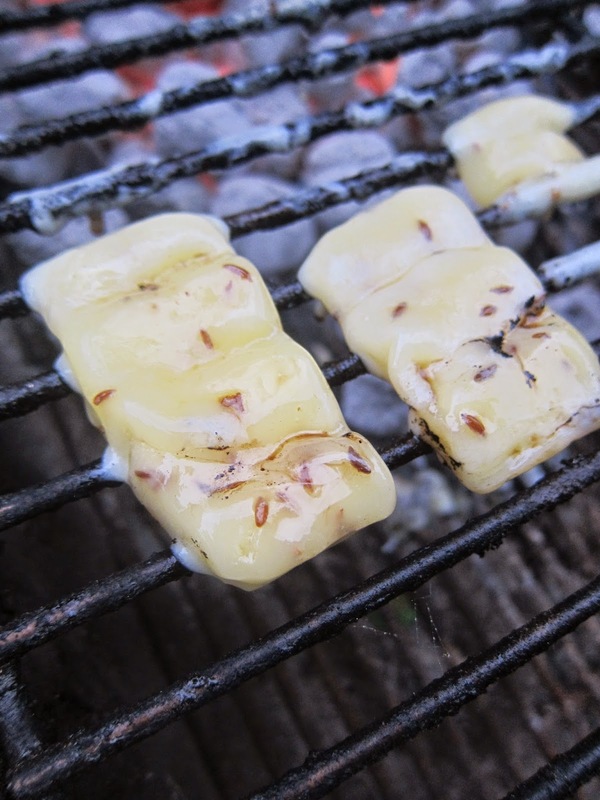 How Did the Havarti Cheese Do on the Grill? You can see in the top right side that the one cheese slice got lost. Bummer. The other two slices, I flipped immediately. Notice the slight dip or bulge between the grates. As soon as you see this, then flip the cheese. Also note that I brushed the cheese with olive oil - very lightly. This helps prevent sticking, so that the Havarti cheese can be flipped quickly. It also adds a nice flavor. I use Garlic Gold which is a garlic olive oil. It only takes seconds to grill this semi soft cheese which is a specialty cheese made at selected dairys by skilled craftsmen. The flavor is lightly buttery with an herby pop. As for serving, we like grilled cheese over charcoal to add that smokey flavor. We plate up as an appetizer immediately off the grill, so the cheese is soft and warm from the heat and smoke. Generally I use Yanni grilling cheese, Haloom, or Halomi which are all high grilling temperature cheeses. Havarti is a bit softer and requires closer attention and quick turning as soon as the melting starts. 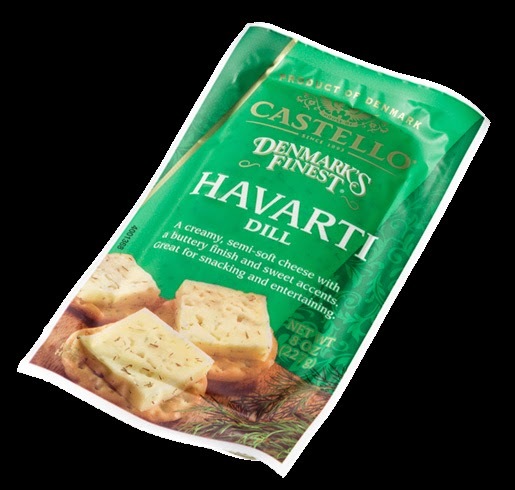 Castello does have lovely cheeses and interesting flavors, so I was happy to get a different overall flavor with the dill. I was impressed with the Havarti even though it did require close attention on the grill grates. The Havarti cheese can, of course, be used more traditionally which would be good on the flavor but not as much fun as grating the cheese on the grill and that extra smoke note.